Obama trip to Alaska: Stark difference between rhetoric and action on climate change. Obama Is a Climate Hypocrite. His Trip to Alaska Proves It. The dangerous gulf between Obama’s words and actions on climate change is growing wider. 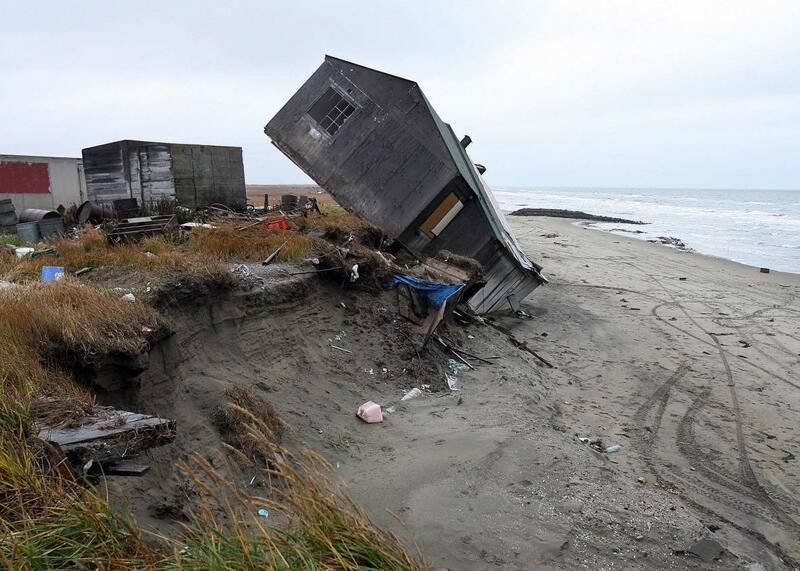 Above, a home in the the Alaskan village of Shishmaref is destroyed by beach erosion in 2006. The entire village is facing evacuation because of global warming. The leases that allow Shell to drill in the Arctic were awarded by the George W. Bush administration, and the president had limited options to block them. Still, as ThinkProgress notes, Obama could have outright canceled Shell’s lease, or begun a process to declare the region a marine protected area, making future leases nearly impossible. Neither of these actions would be easy to do, but either would have sent a powerful message to industry: Starting now, climate change concerns trump energy exploration, period. Climate activists vociferously opposed the approval of Shell’s permit: Last month a group of protesters in kayaks briefly blockaded an Arctic-bound Shell support ship while it was in a Portland, Oregon, port. In recent days Hillary Clinton, the leading Democratic candidate for president, has also voiced her opposition. One progressive activist group, Credo Action, has called the unfortunate juxtaposition of Obama’s words and actions his “Mission Accomplished” moment, in reference to Bush’s declaration of victory in the Iraq war. I agree. “It’s such an odd own goal to first hand Shell a shovel and then go for a visit,” climate activist Bill McKibben told me today. Earlier this year McKibben wrote in the New York Times that the president was guilty of “climate denial of the status quo sort” should Shell’s drilling permit be approved. “Even in this most extreme circumstance, no one seems able to stand up to the power of the fossil fuel industry. No one ever says no,” McKibben wrote. After decades of delay, scientists now say the world—especially countries like the United States with historically high emissions—needs to immediately embark on a radical path of truly bold action on climate change. So far, Obama’s plan for carbon cutting, despite being loudly trumpeted by the administration, has been middling at best. For many environmental activists, Obama’s approval of Shell’s Arctic drilling permit is the icing on an extremely hypocritical cake. Credo’s Elijah Zarlin, who worked for Obama’s 2008 election campaign, calls the rhetoric from the White House surrounding Obama’s visit to Alaska “stunningly brazen,” given the go-ahead for Shell to drill in the Arctic. On the trip, Obama will become the first sitting American president to visit the Alaskan Arctic. He’ll travel to the coastal village of Kotzebue, where Shell has some drilling equipment stationed, to view the effects of rising seas and melting permafrost firsthand. He’ll also film an episode of Running Wild With Bear Grylls, in which he will discuss climate change and receive a “crash course in survival techniques,” according to a statement from NBC. The effects of global warming in Alaska continue to accelerate. This year’s off-the-charts wildfire season was a recordbreaker, burning through even the permafrost. Just last week, another startling “haul-out” of walruses was observed as thousands of animals were forced ashore by the lack of sea ice in the Alaskan Arctic, not far from where Obama will visit. On Sunday the administration announced that Alaska’s Mt. McKinley would be officially renamed Denali. What the president didn’t emphasize enough: Denali is losing its glaciers at a rapid clip. In his weekly address on Saturday, Obama addressed the Shell controversy, saying “we don’t rubber-stamp permits.” But what the president seems to miss is that environmental activists aren’t as concerned with the potentially devastating impacts of an oil spill in the Arctic as the message it sends to the rest of the world: Bold action on climate change doesn’t look so different from the status quo. In reality, the scale of action that climate science demands is far beyond what Obama has put in place. America can’t solve climate change on its own, but it could offer a truly heroic leader. It just doesn’t seem like Obama is the person for the job.